All members of the Chamber are businesses that do business on the South Coast. While most members are based on the South Coast, membership is offered to business that are based outside of the South Coast but in some way have a presence on the South Coast. We have also extended our membership to Non-profit organisations and institutions that operate in the local economy. 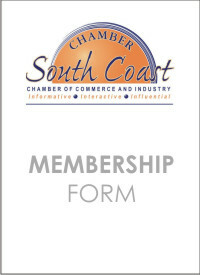 Becoming a member of the South Coast Chamber of Commerce and Industry is quite simple. An email or telephone call to our offices of one of the executives will open the door for us to send to you an application form and price schedule. When a completed schedule and payment is received, a membership form is printed and given to the member. Our members are invited to a host of activities and events and are kept informed of various developments affecting their businesses. We also avail ourselves to provide the various services as per our charter.